Protests Grip Hungary In Response To Overtime Measure That Critics Call A 'Slave Law' The new law allows employers to ask staff to work up to 400 hours per year of overtime — but employers can delay payment for up to three years. Demonstrators protesting against recent legislative measures introduced by the government of Hungarian Prime Minister Viktor Orbán stand outside parliament on Dec. 16, 2018 in Budapest, Hungary. Hungary's Prime Minister Viktor Orbán, a darling of Europe's far right, has tightened his grip on power in ways that have shocked the European Union. His ultranationalist Fidesz party has gamed the electoral system, shut down most independent media, forced out an American university and even created new administrative courts that will be directly controlled by the government. But none of these measures have generated the type of outrage in Hungary that has greeted a new law that allows employers to ask staff to work up to 400 hours of overtime per year. Employers can delay these overtime payments for up to three years. Critics call it the "slave law." 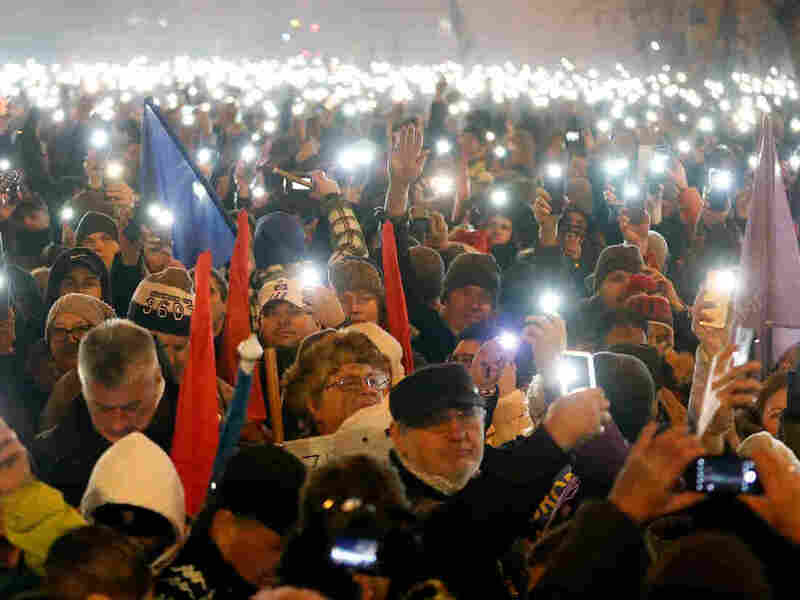 Thousands have protested every night outside parliament in Budapest since Fidesz lawmakers approved the measure on Wednesday. About 10,000 protesters marched to parliament on Sunday, waving Hungarian and European Union flags, and holding up hand-made banners. One read: "All I want for Xmas is democracy." One group of protesters also demonstrated outside the state-run TV headquarters. Media loyal to the government have largely ignored the protests. "It's the first time I've seen signs that there's a united opposition building against Orbán," says Gábor Gyori, a senior analyst at the Budapest-based Policy Solutions think tank. "He did something that has upset a large segment of the population, even his own supporters." A new poll by the Republikon Institute, a liberal think tank, shows that 63 percent of Orbán supporters disapprove of the new overtime law. More than 95 percent of his critics also disapprove. Labor union leaders point out that Hungarians are already upset about low wages and poor workplace conditions. "And now to give employers, especially multinational companies who want even lower wages, so much more power over workers, it's very unfair," says László Kordás, head of the Hungarian Trade Union Confederation. Just before parliament voted on the overtime law on Dec. 12, Orbán told lawmakers that it will help remove "bureaucratic rules" for workers who want to put in more hours and "earn more." The law allows employers to make individual contracts with workers, bypassing unions. Hungary's unemployment rate is low, about 3.7 percent, partly because of an exodus of its skilled workers to other EU member states such as Germany, Austria and the United Kingdom, where wages are higher. Other countries with labor shortages often turn to immigrants, but Gyori says Orbán has been so vitriolic against immigration that "he's painted himself into a corner." "Our population is shrinking," Gyori says. "This labor shortage will only get worse." Kordás says Orbán and others in his party are clueless about working conditions for most Hungarians because most are "professional politicians who have never worked real jobs in the real world. They have no idea what actual working people have to go through." Orbán claims Soros was behind a conspiracy to "flood" Europe with Muslim asylum-seekers. The prime minister's allies are also blaming Soros for organizing the protests against the overtime law. Gergely Gulyás, Orbán's chief of staff, declared that the protesters display "open anti-Christian hatred." Viktor Mak, a 26-year-old Hungarian-American student at CEU, says authorities are also claiming the protesters are dangerous. "They are sending police to tear-gas us and they claim we're the ones who are violent," he says. "Everyone hates this law. Who wants to work overtime and not get paid for it for three years?" One government minister, János Sül, quoted in the Hungarian website Pakspress.hu, said the young protesters have "never worked a day in their lives." A spokesman for Gulyás, the prime minister's chief of staff, said in an email to NPR that Orbán's critics are spreading lies about the law and that "any overtime permitted by the law can only be performed with voluntary employee consent." Kordás, the union leader, rolls his eyes at the comment. "It's hard to make that argument when employers have all the leverage over their workers," he says. Gyori, the political analyst, adds that there's also anger that Orbán's lawmakers rammed the law through parliament without consulting unions or the political opposition. Fidesz altered election rules so that the party controls two-thirds of parliament, even though it received only 49 percent of the popular vote in last spring's election. As a result, opposition lawmakers are virtually powerless. They were reduced to blowing whistles and sirens and singing the Hungarian national anthem in an attempt to delay the vote on the overtime vote last week. The measure passed Hungary's parliament by a vote of 130 to 52 with one abstention. "The problem with Orbán is that he fears the uncertainty that comes with democracy, so he stifles opposition to avoid the fallout of unpopular decisions," Gyori says. "He will do anything to avoid that uncertainty." But some die-hard Orbán supporters say it's the protesters who are sowing uncertainty. Kalman Molnar, a 93-year-old eye doctor, says he's never seen a Hungarian leader "as great as Viktor Orbán." As night fell, Molnar bundled himself in a greatcoat, pulled on his black beret, and shuffled toward the protests "out of curiosity." "Even if 100,000 of them turned out, it wouldn't matter," he said, over the chants of the crowd. "They will always be the minority." Freelance journalist Mate Halmos contributed reporting from Budapest.